If your roof is weighed down by the presence of heavy icicles and more in these snowy months, follow these techniques for removing the ice dams immediately—before the damage is done. Q: After a recent snowstorm, a large band of ice formed above the edge of my roof and created some heavy icicles as well. The weight of the ice is starting to pull the gutter loose and I’m afraid it will pull it off entirely. Is there anything I can do to get rid of the ice before it tears up the gutter or falls on someone? A: What you’re describing is an “ice dam,” and, unfortunately, it’s very common on homes in areas that experience cold and snowy winters. An ice dam is the result of snow that has melted and then refrozen, and the culprit for that thaw-and-freeze cycle is an abnormally warm roof. When the air inside an attic is warm, that warmth can transfer through the roof and begin to melt the layer of snow, which in turn causes droplets to run down the roof. When those droplets reach the edge of the roof, they refreeze, because the part of the roof above the overhang (the eaves) doesn’t receive warm air from the attic. As additional snow melts, runs down, and refreezes, the layer of ice continues to build, creating a literal dam—a barrier that prevents water from running off the roof. You’re correct, it’s dangerous to people (and pets) walking beneath, and it poses a risk to the roof and gutter system. As the ice dam builds it gets heavier. When the weather warms enough for the ice to melt, the dam can loosen enough to come crashing to the ground—sometimes taking your home’s gutter with it. 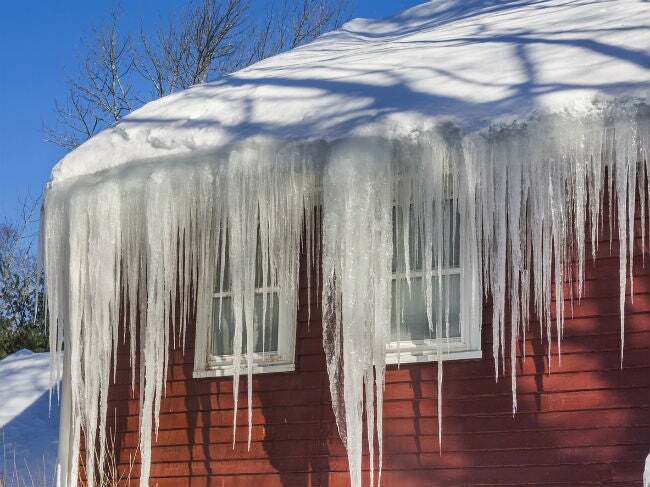 Ice dams can harm the roof in other ways as well: As water seeps between shingles and freezes, it expands, loosening the shingles and penetrating through the layers of the roof until you have a leak and/or interior ceiling damage. Since you’re dealing with one (or more) already, we’ll share some of the best techniques for removing ice dams. But keep this in mind for future winters: The key to long-term protection lies in preventing ice dams before they occur. Melt the ice dam with calcium chloride socks. Calcium chloride is the same stuff used for melting ice on driveways and sidewalks, but don’t just sprinkle it on the ice dam. Instead, fill long socks or the legs of pantyhose with the granules and then tie off their ends with string. A 40-lb. bag of calcium chloride costs around $10 and will fill approximately 10 to 12 tube socks. By pouring calcium chloride into this tube-like form, you can position it vertically over the dam—with the sock’s end hanging an inch or two over the roof edge—and melt a tube-like channel through the ice dam, which will allow additional water that melts to run safely off the roof. A word of caution: Do not substitute rock salt for calcium chloride, as rock salt can damage shingles and kill bushes and foliage beneath. Make sure the ice melt product you buy contains only calcium chloride, which is safe for shingles and vegetation. Break an existing ice dam into small chunks with a mallet. Breaking an ice dam can be dangerous and, if you’re not extremely comfortable being on a snowy and icy roof, better left to the professionals. Breaking an ice dam is usually done in conjunction with melting the ice in some fashion, such as with the use of calcium chloride socks as described above, or with roof steaming (below). First, a cautious homeowner or professional hire should clear the roof of excess snow and melt drainage channels in the dam. Then, as the ice is beginning to melt, the edges of the channels can be carefully chipped away with a mallet to widen them and hasten drainage. Breaking an ice dam can result in large swaths of ice crashing off the roof, breaking windows, damaging bushes, and injuring anyone below, so extreme caution must be taken. The person breaking the ice dam should do so from the vantage point of being on the roof, not from the ground where the heavy sheets of ice will fall. Have a professional steam your ice dam away. Steaming away ice dams is a professional-only task because it requires the use of commercial steaming equipment that heats water and dispenses it under pressure. The roofing professional will first remove excess snow from the roof by shoveling and then steam channels through the ice dam to help it melt. He may chip away parts of the dam as he goes until the roof is clear of ice. Hiring a professional ice-dam removal crew can be pricey, running approximately $200 to $300 per hour. 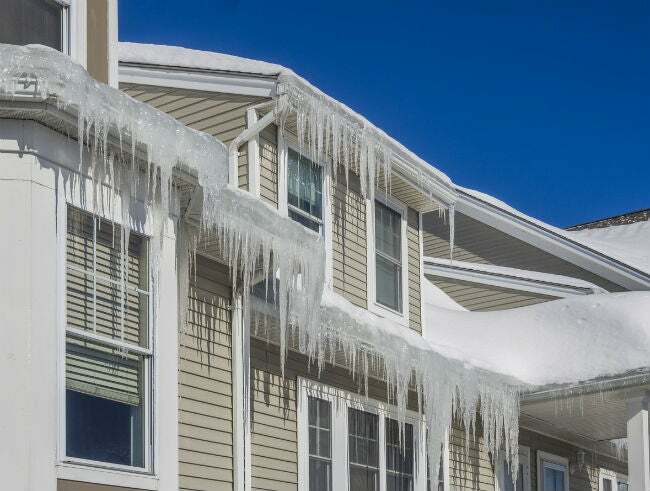 Escape the damage caused by ice dams by preventing them from forming in the first place. Some prevention methods require removing snow from your roof, while others entail lowering your home’s attic temperature to prevent heat transfer from the attic to the roof. 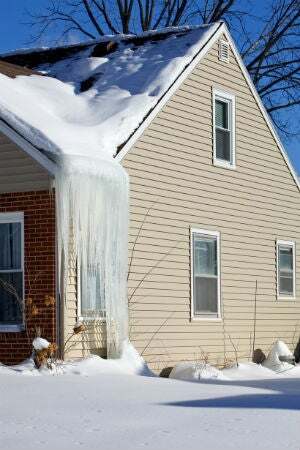 Try one or more of the following steps to help prevent ice dams from forming. • Rake the lower three to four feet of your roof after a snowfall. You can pick up a lightweight roof rake, with a 20-ft. extension, for less than $30 at many home improvement stores. Immediately after a snow, when the snow is still soft, rake the lower part of your roof (the eaves) clear of snow. This will help reduce ice buildup. • Add attic insulation. The idea is to stop the transfer of heat through the roof, which triggers the thaw/freeze cycle. An extra 8- to 10-inch layer of attic insulation will not only help prevent heat transfer, it will also help retain heat inside your home, so you’ll spend less to keep your house warm in winter. • Seal all interior air flow leaks in the attic. No matter how much insulation you add to your attic, if warm air from your living space is entering the attic through gaps and vents, your attic will still be too warm. Eliminating interior air flow involves sealing all gaps around sewer vent pipes with insulating foam and having bathroom and dryer vents rerouted from the attic through an exterior wall of your home. • Ventilate your attic to keep it cool. Intake attic vents should be installed along the underside of the roof eaves, in the soffit, and exhaust vents should be installed at the top of the roof. Cool air will naturally enter the soffit vents and, as it warms in the attic, rise and exit through the exhaust vents at the top of the roof. Because roofs vary in size and configuration, developing an attic ventilation system is a job for a qualified roofing professional. • Install deicing cables. You can find roof de-icing cables at home improvement stores for $125 to $250 that install directly on top the shingles, via clips, over the eaves of the roof. Those will work in a pinch to keep ice dams from forming, but they are visible and raking your roof can dislodge them. • Invest in a professionally installed deicing system that connects beneath the shingles. A professional system should be installed by a qualified roofing company at the same time they install new shingles on the roof. These systems will not mar the look of your roofline and they are designed to last for years. Depending on the size of your roof, a professionally installed system could add an additional $2,000 to $4,000 to your total roofing cost.